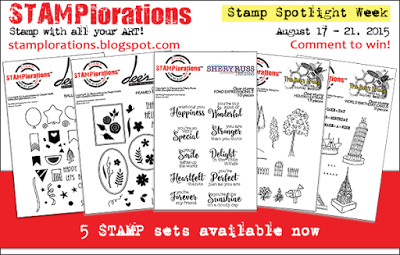 Hello, and welcome to the STAMPlorations blog hop for the July stamp release! Today we're showcasing my World Birthday Cakes set. The idea started with the Leaning Cake Tower of Pisa - it always reminds me of a wobbly cake, so I thought I'd draw it as one, complete with candles on the top. Then came Sydney Opera Cake, Eiffel Tower Cake and finally Chrysler Building Cake. A few telex-style sentiments and there you have it. I made my background with my 5x3 Gelli Plate, some ARTplorations stencils and a pattern tool for the wavy lines, then stamped the Sydney Opera Cake onto spare card, coloured and mounted it. 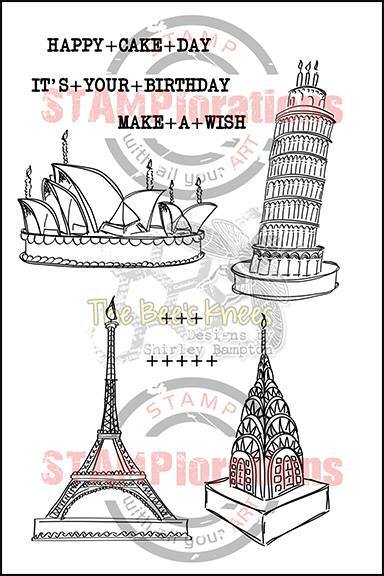 FIVE (5) commenters randomly drawn from the designers' blogs will each win the stamp set featured for the day. So don't forget to leave a comment at each stop! What a really fun & creative background - gorgeous! Wow...love that background, Shirley! Absolutely gorgeous design! Like your funky background! That opera house seems to be floating in water! Love the gelli plate background! Really sets off the stamp well! 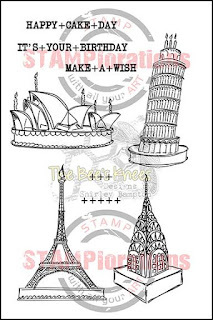 Beautiful stamp set!! Love how you have made each monument into a candle..
You are so clever and creative my friend. 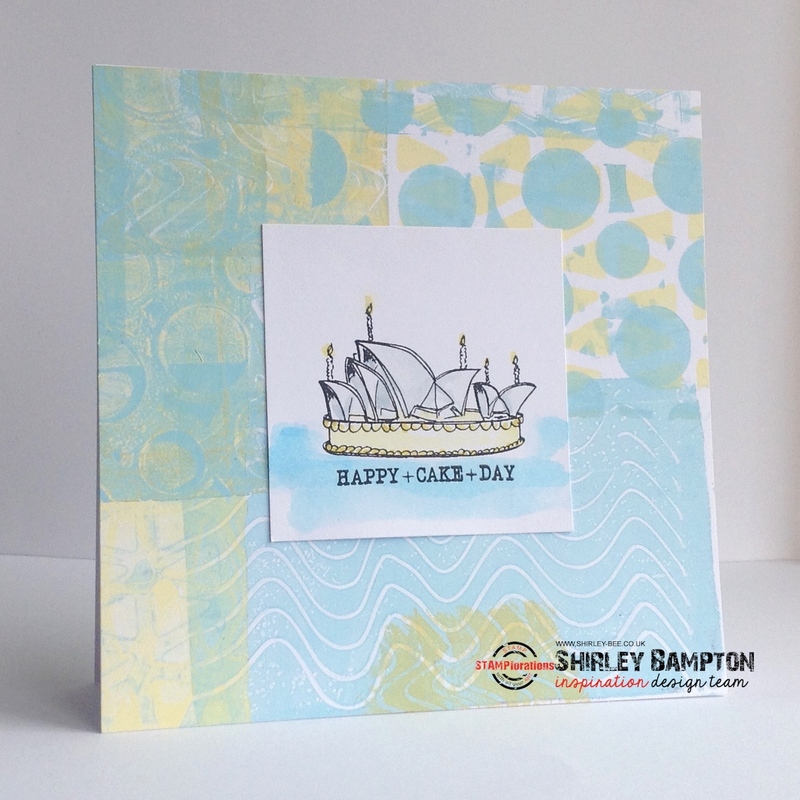 I love your Gelli Plate soft colored background with all your stenciling and your Sydney Opera House cake :-) TFS Shirley. Awesome stamps! Love how you think girl! Turning all these awesome places into cake related images is beyond "sweet"! Love the Gelli printed background...really complements the stamped image! Awesome card! Simply fabulous card....what a sweet birthday cake! I love how you tied in your layered background image colours to the colours in the stamped and mounted birthday cake image. Absolutely stunning Shirley - love the gelli plate background. What a wonderful and lovely background for that cool image!!! Fantastic card, I love this stamp! Absolutely stunning creation, love the background and this gorgeous World Famous Building cakes! 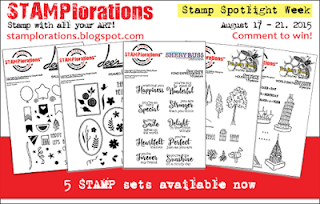 Cheering and applauding your most recent - and unique - new stamp set! Your background is perfect to showcase your Sydney Opera House cake. Remarkable...loving the candles! Such a great stamp set, and I absolutely adore your background!